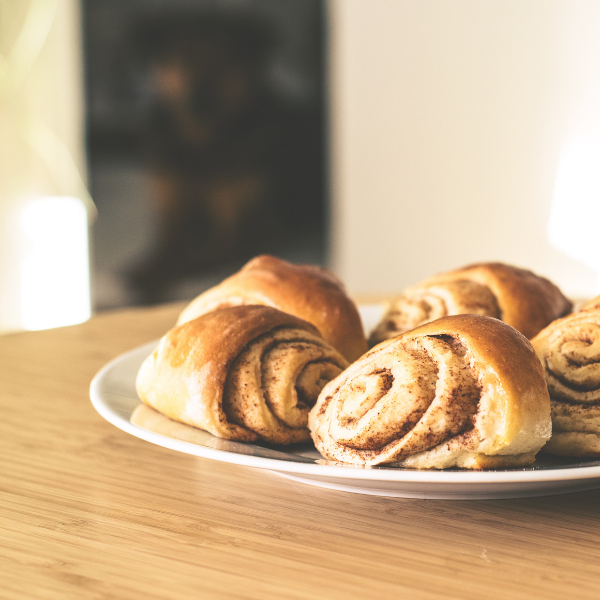 Pommies Cinnamon Rolls » Pommies Cider Co.
One of our favourite Pommies infused recipes. Try our Pommies Cranberry Cinnamon Rolls for the perfect dessert. In a large bowl, combine 2 1/4 cups flour, sugar, yeast and salt. In a small saucepan, heat the milk, Pommies Cranberry Cider and 1/4 cup butter. Add to flour, sugar, yeast and salt - mix until moistened. Add egg - mix until smooth. Stir in remaining flour to form a soft dough (sticky). Spread a light layer of flour on counter. Spread dough on top. Work in dough until smooth. Cover and sit for 10-12 minutes. Roll into rectangle. Spread remaining butter onto dough. Combine the apples, brown sugar, walnuts and cinnamon, and sprinkle over butter. Roll up jelly-roll style, pinch seam to seal. Cut into 12 pieces. Place cut side down in a greased 13 9-inch baking dish. Cover and let rise in a warm place for 30 minutes. Bake at 325° for 30-35 minutes or until golden brown. For frosting, place Pommies Cranberry Cider and cinnamon stick in a small saucepan. Bring to a boil. Cook until liquid is reduced (approx. 20 minutes). Take cinnamon stick out; let cider cool. In a large bowl, mix cream cheese and butter until fluffy. Add powdered sugar and cider; beat until smooth. Spread over warm rolls.